Mustaine says he's avoided using one in the past "for obvious reasons." Performances include Megadeth's "Dystopia" and Loureiro's own "Dilemma." New compilation features 35 tracks hand-selected by Dave Mustaine. The guitarist revisits a particularly challenging lead. The event promises a journey that will take fans "thrashing through the Pacific." Singer and guitarist Dave Mustaine celebrates his 57th birthday today. The Megadeth frontman discusses "high caliber" of the music and "secret weapon" Marty Friedman. 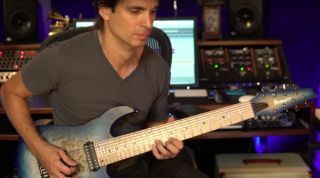 The Megadeth guitarist posts video of himself working out some licks in the studio. The Megadeth leader calls the Guns N' Roses guitarist a "terrific talent." Supergroup featuring members of Megadeth and Testament are joined by Armored Saint's John Bush on new song.